One day, I was craving fried chicken. 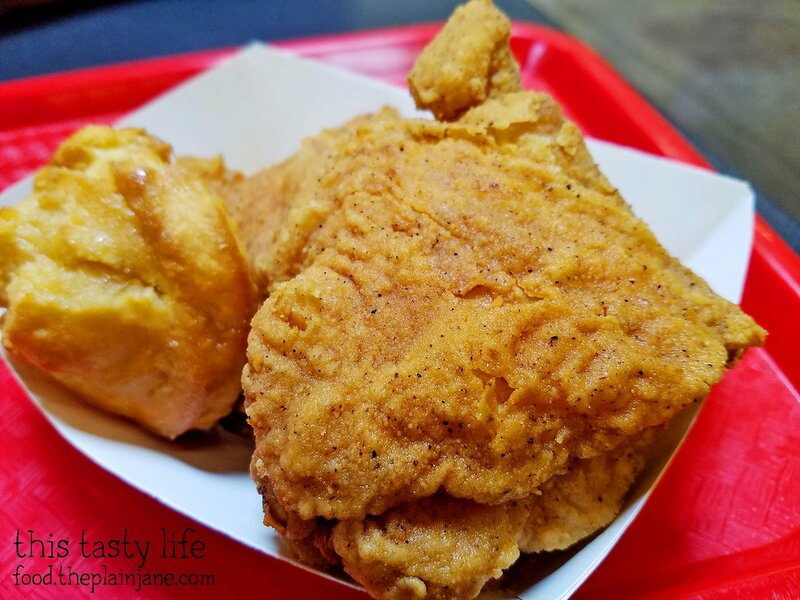 I had just gone to a chiro appointment and figured I’d check out a place called Krispy Krunchy Chicken that’s over in the new(er) 99 Ranch Market off of Balboa Avenue. Krispy Krunchy Chicken is located in the food court and luckily there was not much of a wait. They have a lot going on here with the signage. It’s like you have no idea where to look – everything is trying to get your attention at once! 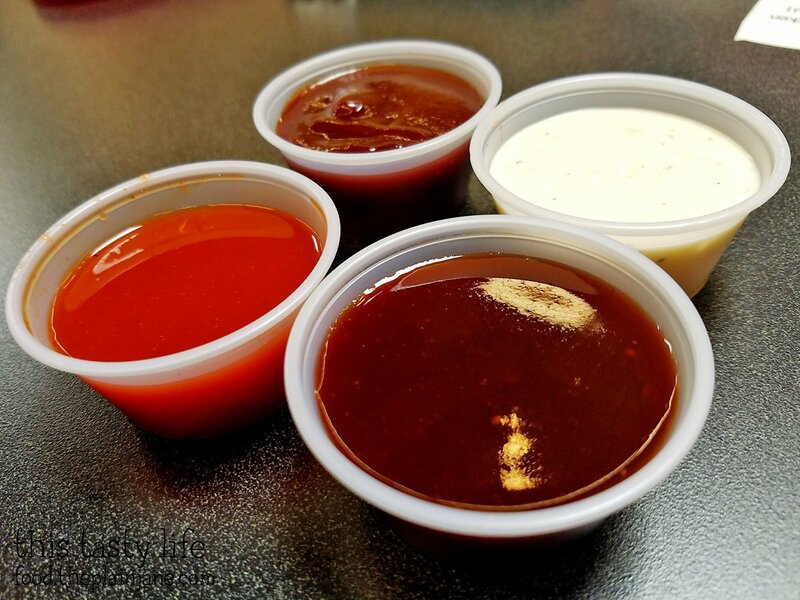 They have a bunch of different sauces for you to dip your chicken (or fries, or other foods) into. 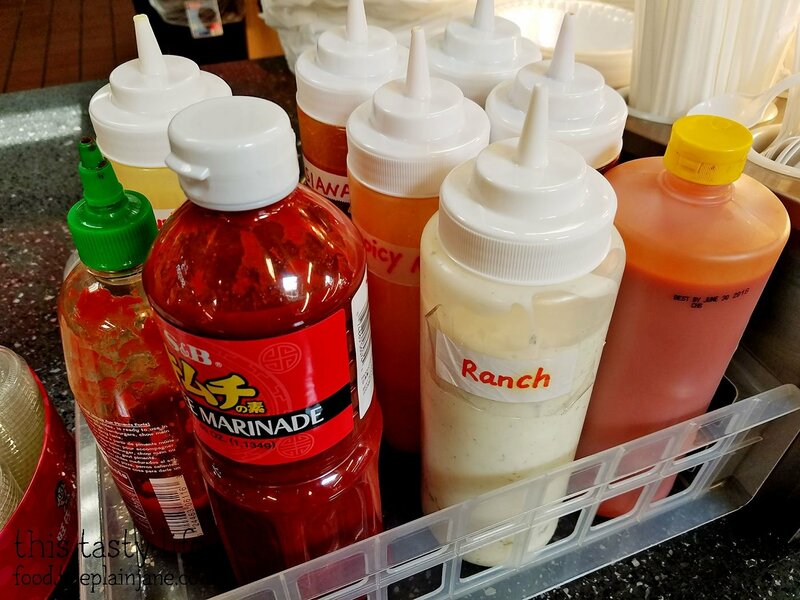 These are hanging out at the counter and they have tiny plastic cups so you can grab some sauce. On my initial visit I went for a simple chicken combo. I got the 2 piece Dark Combo with a side and a drink [$6.98]. 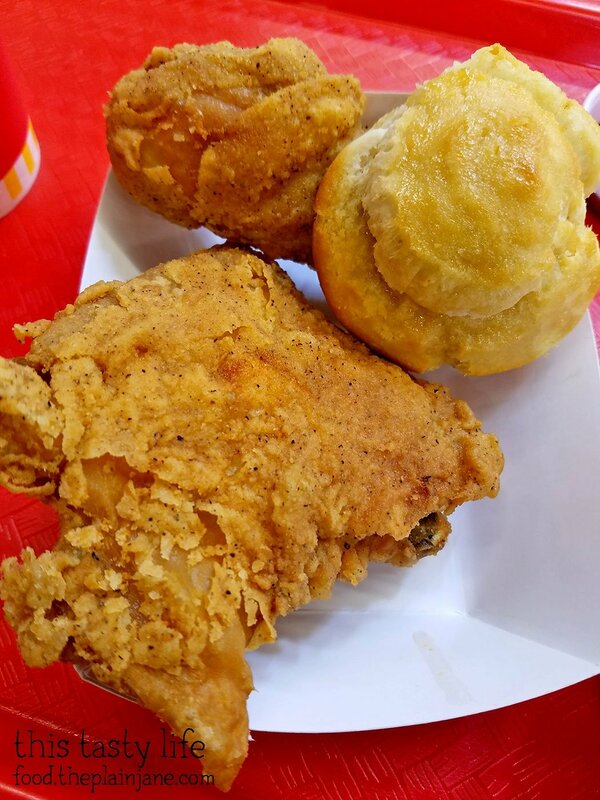 You get one thigh and one drumstick along with one of their honey butter biscuits. 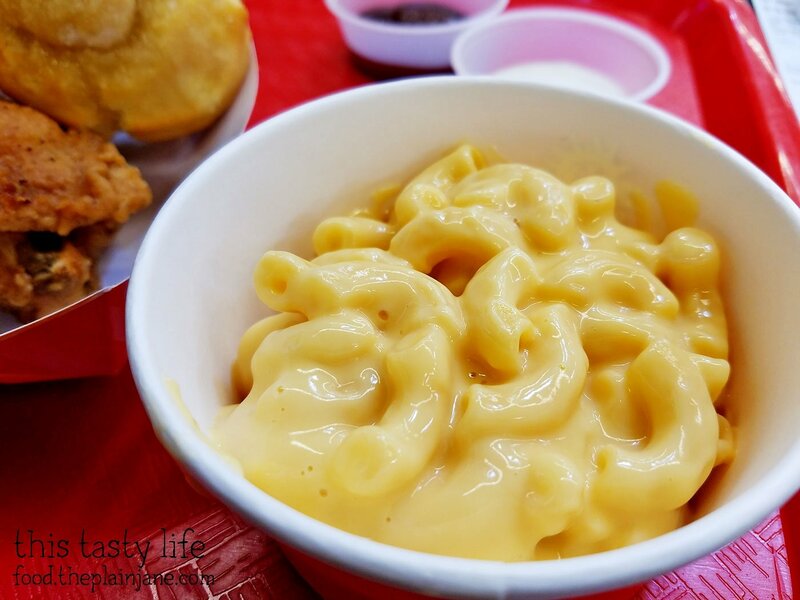 At Krispy Krunchy Chicken, you can choose between the following sides: mashed potatoes & gravy, red beans & rice, mac & cheese, or jambalaya. For my side, I went with the mac & cheese. It was quite creamy but I felt the cheese flavored was a bit watered down. Because of that this mac & cheese was on the bland side. Not outstanding but not the worst I’ve ever had. 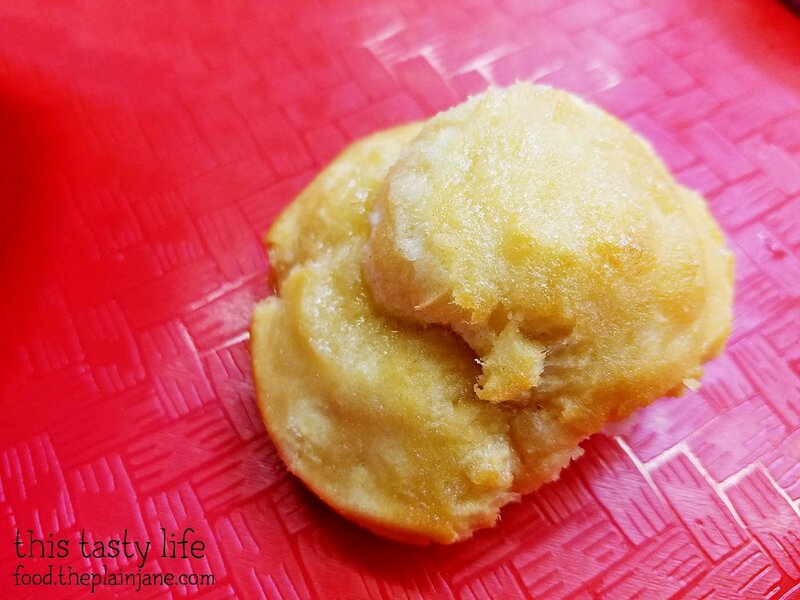 The honey butter biscuit seemed promising to me and it had a nice little honey looking glaze all over it. The flavor was good but I felt the texture was a bit off. It was way too soft for my liking – I was hoping for crunchy edges and I didn’t really get that. I much prefer the honey biscuits at Church’s Chicken. I got ranch and bbq sauce. 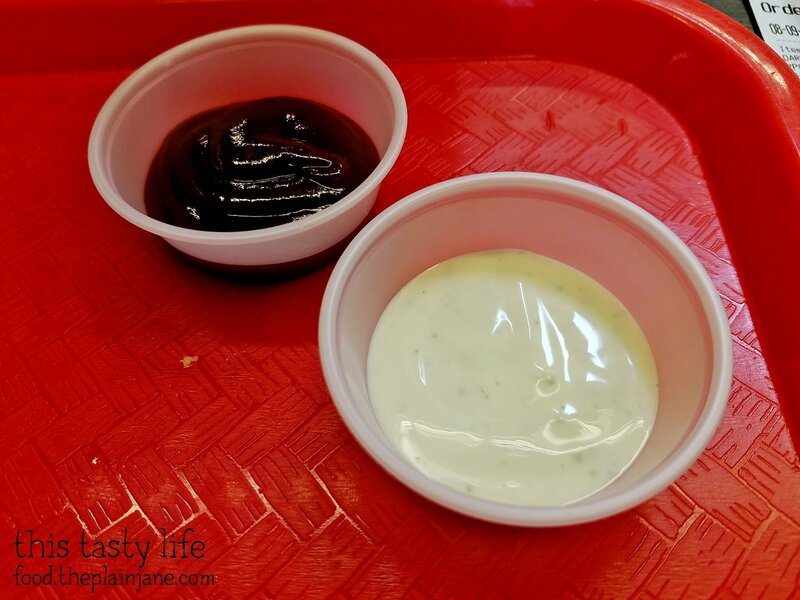 I liked their tangy-sweet bbq sauce for dipping my chicken. 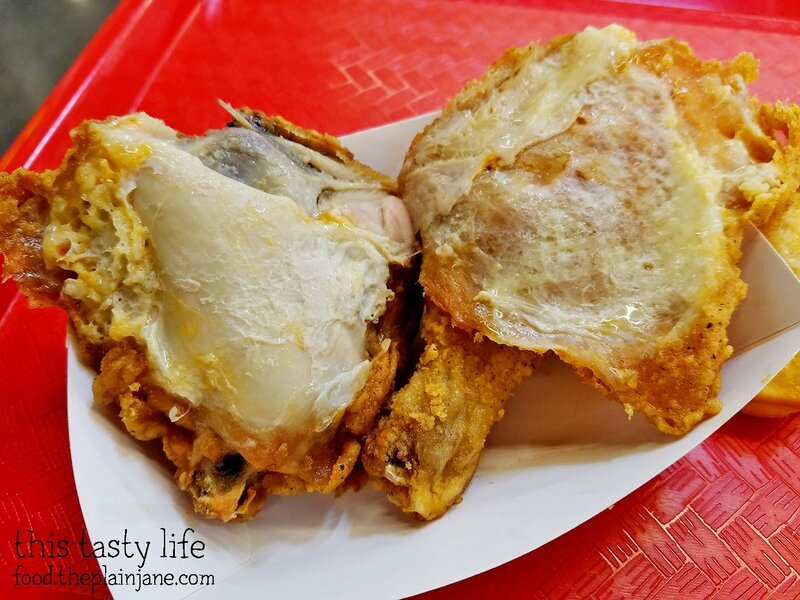 Here’s a closer look at the fried chicken. You can see some spices going on in the coating. And a look under the chicken skin. The chicken was very moist and juicy. It had a really excellent flavor that paired well dipped into my sauces. It didn’t taste like a grease bomb (even though it might look like it from the inside). I like the seasoning on the batter as well. It wasn’t spicy but simply enhanced the flavor of the chicken. And the skin/coating was quite crispy so I loved the texture of it. Good stuff! I liked Krispy Krunch Chicken enough to bring Jake here on another visit. This time around we got a 3 piece Dark Combo to share [$7.98]. It’s essentially another dollar for one more piece of chicken which is a good deal. 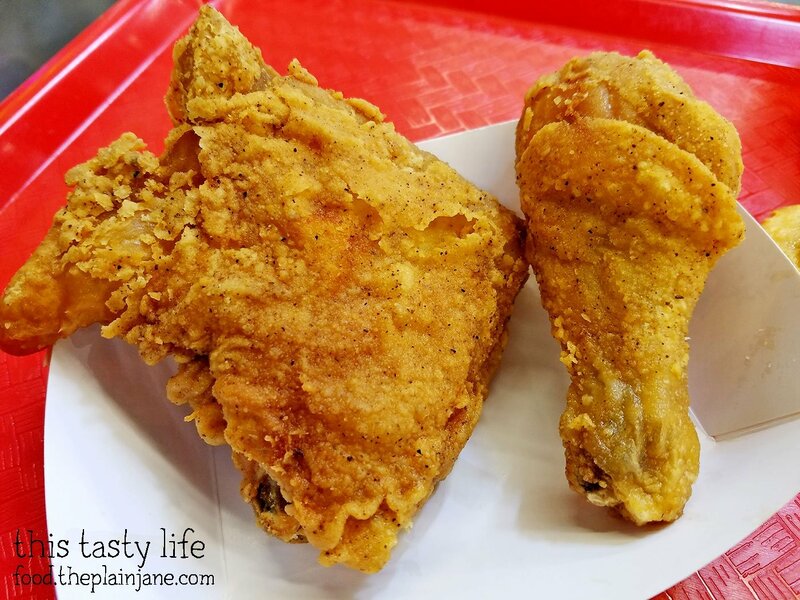 With the three piece, you get two chicken thighs and one drumstick. 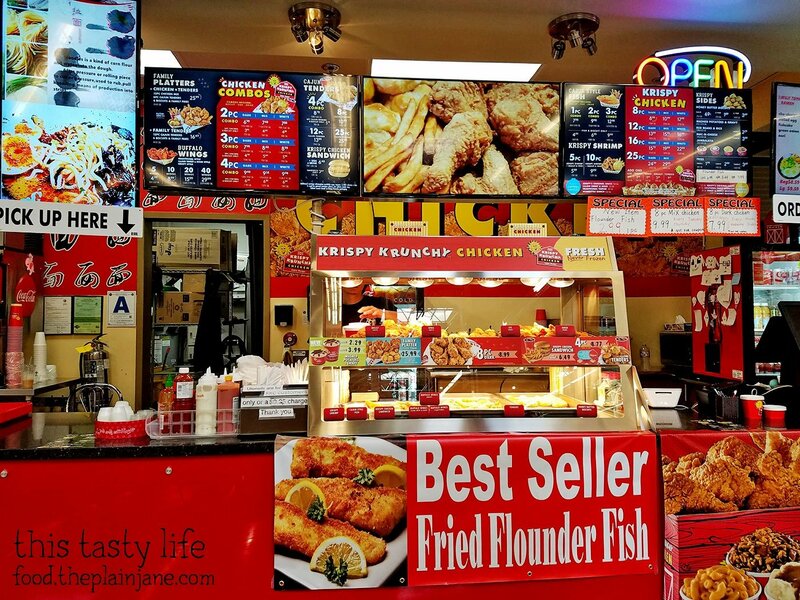 Again I was impressed by the texture of the chicken and by the flavors and spices in the batter. A few more sauces this time since Jake was the one in charge of acquiring sauces. The one in the lower right turned out to by my favorite – it was a sweet wing sauce. It had almost a sweet and sour flavor to it that I really enjoyed. I think the red sauce is a hot sauce? I didn’t try that one. The other two are bbq and ranch again. 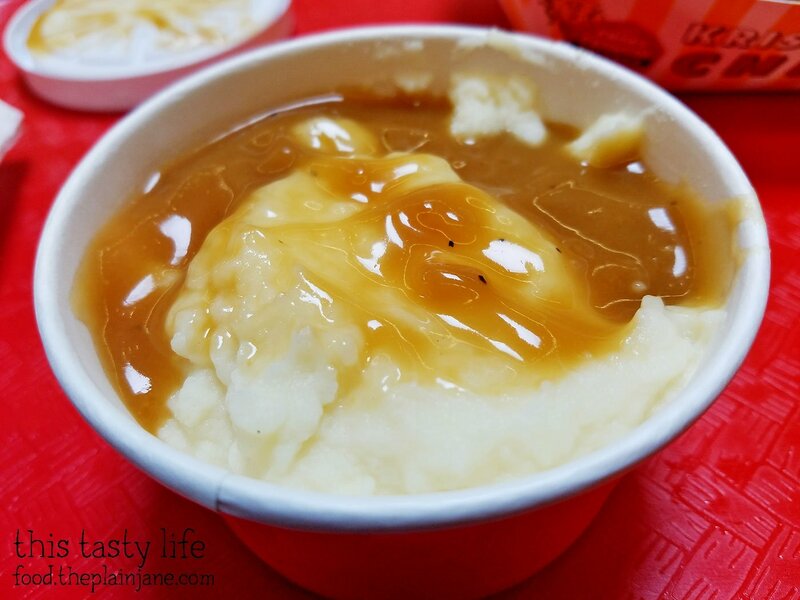 This time we got mashed potatoes & gravy for the side and this was much better than the mac & cheese. I wasn’t super crazy about the gravy but the potatoes tasted pretty good. Jake really liked these and was quite fond of the gravy. I decided to try some of the seafood at Krispy Krunchy Chicken and opted to get the 5 piece Krispy Shrimp combo [$5.99]. It comes with shrimp, a biscuit, and fries. 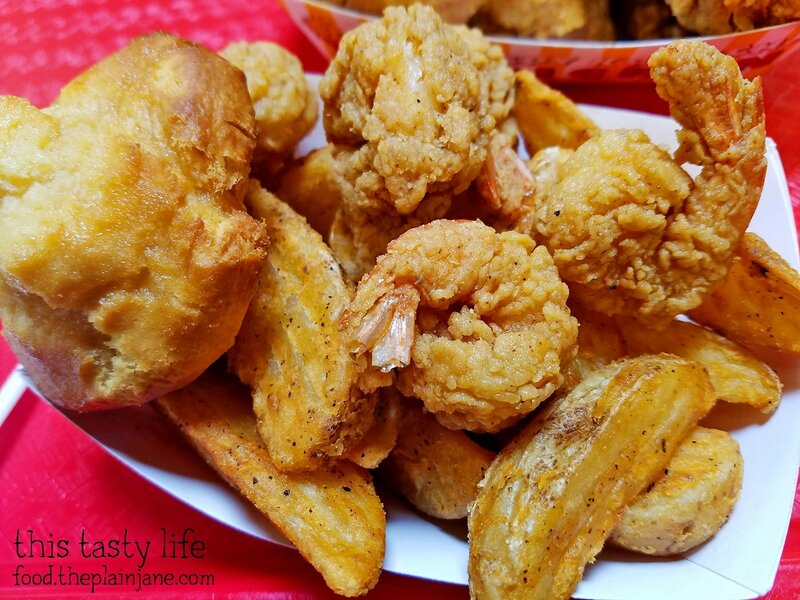 The shrimp are battered in semi-thick batter and are well seasoned. They are also a bit spicy! I dipped these into the sweet wing sauce to cool them down a little and really enjoyed the combined flavor of the spiciness with the sweet wing sauce. The fries are potato wedges which surprised me since all of the photos on the menu are of shoestring style fries. They had a little bit of a batter coating on the wedges and a similar seasoning to the chicken. A little on the soft side, but I still enjoyed them. I think I’d like to come back and try out their buffalo wings! I do really like their chicken but I think the sides are just okay. Maybe next time Jake and I will get only chicken and take it on a picnic with my own side dishes! The best thing at KKC is to order 10 wings. When you order that; they’ll fry it up fresh for you. It’s much better than the stuff under heat lamps. Good to know, Kirk! The shrimp took longer, too, so that was also fresh. Wings next time! I tried them out when 99 Ranch first opened but never posted on it. I thought their fried chicken was pretty salty. Maybe I need to try them again, freshly fried and maybe a few other items for comparison. Ohhh. Maybe they were still working the kinks out then. I definitely want to take up Kirk’s suggestion and gets the wings!